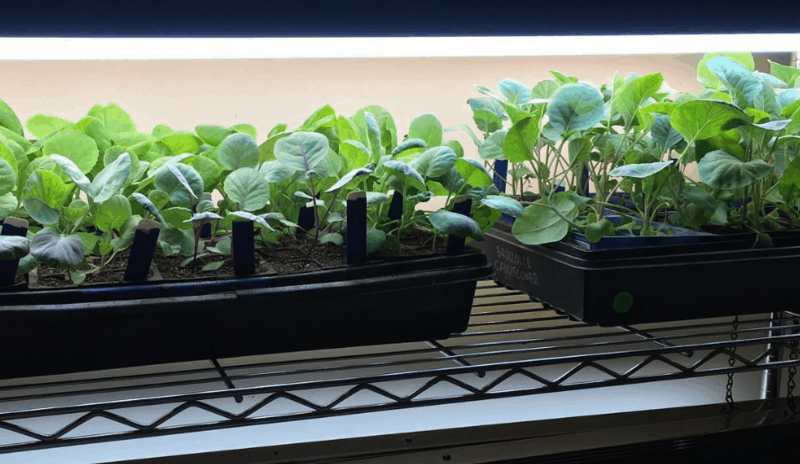 Foreward by Aaron von Frank, cofounder of GrowJourney: The writer of this article, Dr. April Gordon, is better known to me as “mom,” and has been a lifelong inspiration to everyone fortunate enough to know her. A voracious reader, scholar, world traveller, and social scientist, she introduced me to organic gardening before I was even old enough to form memories. The inspiration for me learning to walk was likely due to my desire to more effectively raid her organic veggie and berry patches. 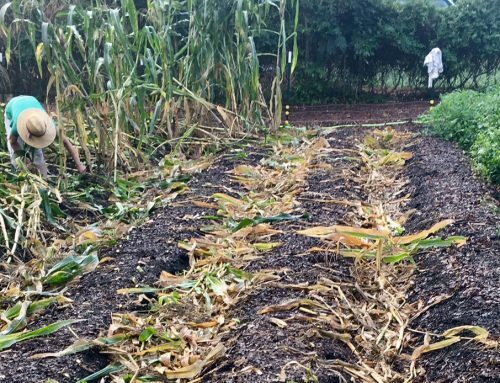 Mom was introduced to organic gardening by her father, my Grandpa George, who in turn was inspired by the writings of the “father of organic agriculture” in the United States, J.I. Rodale, for whom the Rodale Institute is named. It’s fascinating to reflect on the fact that the seeds for my passion were sown long before I was born. I connect most deeply to the world through my garden, but through gardening I also connect deeply with the people who formed me, in ways known and unknown. To them I am eternally grateful. I’ve been a vegetable and landscape gardener for decades, but am now a dedicated butterfly gardener as well. I arrived at this point in stages. Initially I saw my flower and other landscape plants as mostly separate from my edible plants. Consequently, I would find myself plotting how much of my yard would be devoted to landscaping and how much would be set aside for my veggies, herbs, and fruit plants. The first breakthrough change in my thinking came when I began reading about edible landscaping. Previously, I’d never considered growing edible plants in my landscape beds. I soon discovered how pretty, multi-colored chards and kales look among my pansies, snapdragons, and begonias. Colored peppers, okra (in the hibiscus family with comparably beautiful flowers), and some eggplant varieties are also quite decorative mixed with ornamental grasses, flowers, and shrubs. Okra is closely related to hibiscus, which you might be able to tell from this beautiful okra flower. Cascading tomatoes look wonderful flowing over the edge of my containers on the patio by themselves or interplanted with grasses and edible flowers. My cherry trees and blueberry bushes are interplanted with daylilies, sunflowers, hydrangeas, and irises. Herbs such as lavender and fennel are showy evergreens used as specimen or border plants. And strawberries make a pretty evergreen ground cover around my fig tree along with garlic chives and evening primrose. American Lady (Vanessa virginiensis) foraging on garlic chive flowers. Both the leaves and flowers are edible to people. These are but a few examples of infinite numbers of plant combinations that serve to provide food for both gardeners and pollinators alike. Another revelation has been how many flowering landscape plants I have that are edible, such as violas, pansies, calendulas, roses, and nasturtiums. The more I read, the more I realize I can have my cake, so to speak, and eat it too! Yet another shift occurred several years ago as a result of years teaching a university course on the environment. I became aware of the growing threats to bees and butterflies (especially the Monarch butterfly) that pollinate many of our food crops—both commercial and garden—due to habitat loss, climate change, and the use of pesticides. Both bees and butterflies are being killed directly by toxic chemicals or indirectly as a result of the destruction of their habitat or the replacement of the plants they depend upon for survival. Pipevine swallowtail (Battus philenor). This image shows the 15 day transition between 3 stages: larva/caterpillar > pupa/chrysalis > adult/butterfly. Without Pipevine plants, these butterflies can not survive (these caterpillars fed on Dutchman’s pipevine). In 2015, this concern for butterflies and my love of gardening led to my developing a community butterfly garden with two of my gardening neighbors. A group of dedicated volunteers has joined us in maintaining the garden and promoting awareness of the need to protect our Lepidoptera environmental allies. Spring 2017 begins our third season, and so far the garden has been a great success for butterflies, bees, and other creatures including human visitors of all ages. The I’On community butterfly garden in Mt. Pleasant, SC, on top of what was formerly a patch of turf grass. 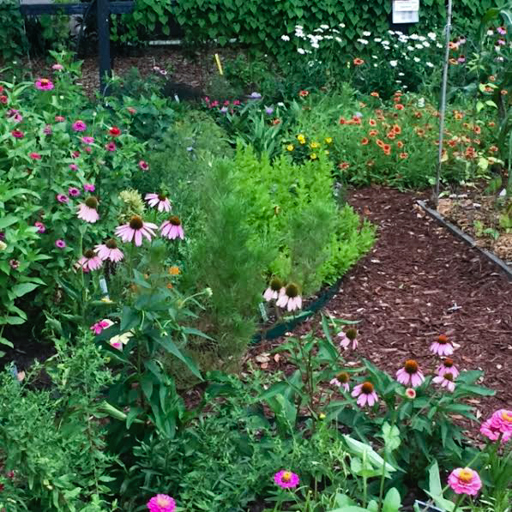 You may be wondering how a butterfly garden and edible gardening are related. So did I at first. Along with changing my landscape and gardening choices to combine edible and landscape plants, I began assessing how I could simultaneously garden for butterflies. One important step is to garden organically. Butterflies are very sensitive to toxic chemicals, so I do not use any non-organic pesticides or herbicides. Even organic products must be used carefully to avoid inadvertently harming butterfly eggs and larvae. The next issue was to further refine my plant selection to combine the functions of beauty, edibility, and attractiveness to butterflies. An Eastern Tiger Swallowtail foraging on Monarda, a gorgeous edible and medicinal herb. I discovered that because of the various stages of a butterfly’s life cycle [from egg, to caterpillar (larva), to pupa (chrysalis), and adult butterfly], it’s important to grow more native plants that have co-evolved with butterflies in their local environments. I was surprised by how many of my landscape plants (and those of most people) are not native plants. What this means is that these alien plants, because they did not evolve here but in Asia or elsewhere, are usually harder to grow and much less likely to provide food or habitat for butterflies or their larvae. Although adult butterflies will sip nectar from many flowers—both native and non-native—their larvae often depend on the leaves of native plants for their food. Milkweed (specifically Asclepius tuberosa) flowers on the left and seed pod/seeds on the right. This beautiful flowering plant is critical to the survival of Monarch butterflies – it’s their larval host plant. Monarchs are projected to go extinct in the next two decades if current population decline trends continue. A case in point is the Monarch butterfly that can feed on nectar from many flowers; but Monarch caterpillars only eat the leaves of milkweed plants. The loss of native milkweed across the United States due to habitat destruction and toxic agricultural chemicals is a major reason for the Monarch butterfly population crash in recent years. The beautiful roses, hydrangeas, and gardenias sprinkled around my yard are as lonely as the Maytag repairman as far as butterflies are concerned. Their flowers do not provide nectar for butterflies or leaves for their eggs or larvae. So the first change I made was to add more native plants to my yard such as bee balm (monarda), coreopsis, milkweed, coneflowers (echinacea), Mexican sunflower, Joe Pye weed, coral honeysuckle, and passionfruit vine, among others. Gulf fritillary butterflies (left) only lay eggs on our native passion fruit vines (Passiflora incarnata), even though the adult butterflies feed on many different species of flowers. Various native pollinators adore passion fruit flowers, as you can see from the bumblebees gorging on the nectar in the center image. As a reward for growing this plant, gardeners get to enjoy piles of delicious sweet and tangy passion fruit in late summer (right). I continue to be confronted with how little I know about my plants. 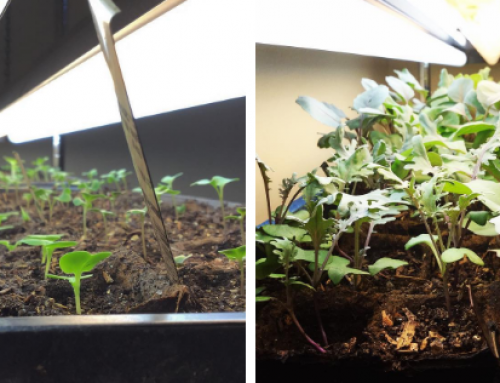 For one thing, the neat division between edible and non-edible plants or parts of plants may not in fact exist. For example, more of us now realize that many flowers grown for their beauty can be consumed as food or in drinks. Nasturtiums, roses, pansies, and calendula are good examples. And if you haven’t tried elderflower liqueur, yum! This is a beautiful Question Mark butterfly (Polygonia interrogationis), recently emerged on an elderberry plant, which provides edible/medicinal flowers and fruit. Leaves of edible plants commonly thrown away can also be eaten. 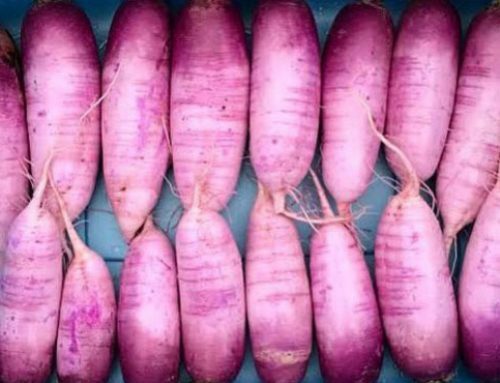 For example, I used to discard the leaves of my beets; now I eat them along with the beet root. Pea shoots and tendrils are delicious cooked or in salads. Many leaves or flowers from butterfly plants such as bee balm, lemon balm, and New Jersey tea make tasty teas and often have medicinal value as well. I still have much to learn about how extensive and interrelated the world of landscape/decorative and edible plants is. Also ongoing is my search for which vegetables and herbs I can grow along with flowers that are beneficial to butterflies. As a preface let me draw an important distinction between nectar and host plants for butterflies. For illustration, if you see a black swallowtail butterfly on your sunflowers, it is probably dining on the flower’s nectar, which meets its need for food. If you notice swallowtail butterfly caterpillars devouring the leaves of your fennel plant, the fennel serves as a host plant. Some plants, like milkweed, are both a nectar plant for Monarch butterflies (their flowers) and a host plant (their leaves) for their caterpillars. These zinnias make a wonderful food/nectar source for Monarch butterflies, but they are not a host plant for their larvae. Attracting butterflies can have less appeal when our vegetables are involved. 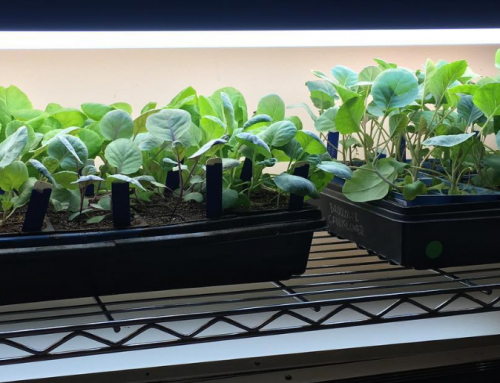 In my garden, among my favorite vegetables are leafy greens such as kale, cabbage, mustard, and broccoli (Brassica family) and beans and pea (Fabaceae family). 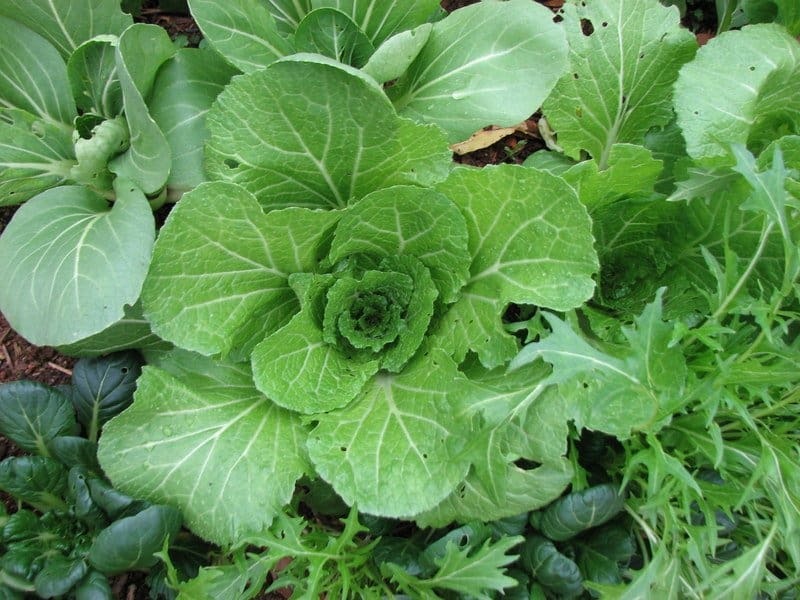 Brassicas are not only healthy and delicious food but in many cases very decorative as well. They also are a host plant for one of our worst “pests,” the green cabbage worm, which is the larva of the beautiful cabbage white butterfly, a non-native accidentally introduced from Europe in the 1800s. (Another caterpillar I find fattening on my brassicas is the less well known cross striped cabbage worm, the offspring of a cabbage moth, of which there are several varieties.) These caterpillars can cause a lot of damage to the leaves of your brassicas once spring arrives so you need to decide if you want to cover your plants, harvest them before butterflies begin laying eggs, or remove the eggs and caterpillars before they do damage. It’s hard to believe that the larva/caterpillar (left) munching on this bean leaf will turn out to be such a gorgeous adult. 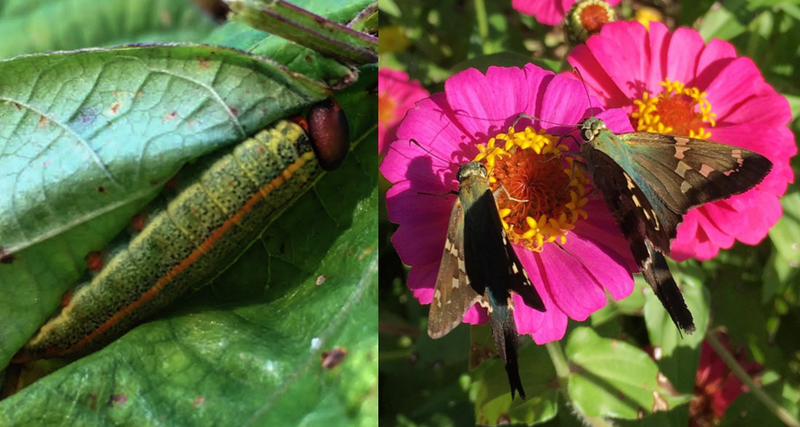 The adults (right) are called long-tailed skippers (Urbanus proteus), seen here foraging nectar on zinnias. If you have a healthy ecosystem, they never proliferate to the point of becoming serious pests to your beans. Beans and peas are host plants primarily during the summer for the lovely long-tailed skipper. If you see the leaves of your beans shredded on the edges and folded over, you will typically find a caterpillar hiding inside. In most cases these caterpillars do no major damage to my bean crop, so I leave them alone. I enjoy peeking inside the folded leaves and watching the caterpillars grow knowing they will become a beautiful skipper butterfly. Luckily, most of your garden veggies are not host plants for butterfly caterpillars but their flowers may be used for nectar, which helps in pollination. A black swallowtail just emerging from its chrysalis (the yellow papery object just to the left of its body) on a fennel plant. Many of the herbs we grow are also nectar and/or host plants for butterflies. I first discovered this when I found my bronze fennel plant (a very attractive landscape plant I use widely around my yard) covered with colorful white, black, and yellow striped caterpillars. I had no idea what they were and began picking them off my fennel to “save” the plant from being devoured by this hungry horde. Only later did I find to my great remorse that I had probably destroyed numerous black swallowtail butterflies through my ignorant action. I have learned that the caterpillar does no longterm damage to the fennel, which quickly grows new fronds. In addition to fennel, black swallowtail caterpillars can also be found on dill, carrots, celery, parsnips and parsley (all related to fennel in the Apiaceae family). 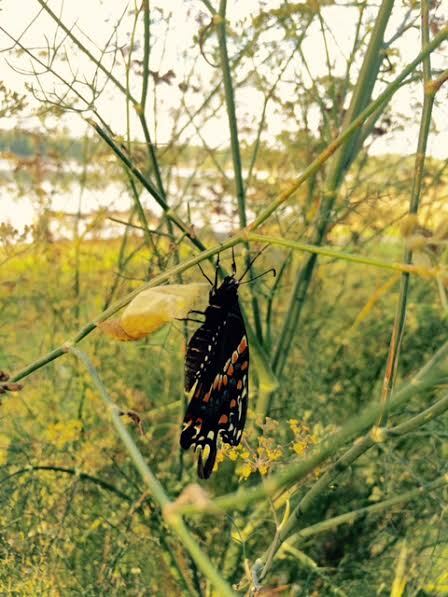 One of my most exciting experiences was seeing a black swallowtail butterfly on my fennel emerge from its chrysalis (the case which the caterpillar makes around its body before it transforms into a butterfly) and then fly away. A day later it was sipping nectar from a nearby red pentas flower. I now look forward to seeing the black swallowtails arrive to lay their eggs and watching the caterpillars grow into pupae. Other common herbs are mostly used by butterflies as nectar plants. These include borage, mint, oregano, sage(salvia), chives, lavender, bee balm, catnip and catmint. Butterfly gardens with edible plants don’t just benefit human beings and butterflies, they also benefit other native pollinators as well, like this bright green Agapostemon splendens bee. I still have a lot to learn about gardening for landscaping, consumption by people, and food for butterflies. What I have shared with you is only an introduction to this topic based on my continuing research and gardening experience. Observing the ever fascinating lives of the flora and fauna that interact in my garden and my community butterfly garden gives me enormous joy and connects me to the natural world of which I am a part. I learn from other gardeners too and hope to hear from some of you about your experiences gardening for butterflies! April Gordon is Professor Emeritus of Sociology from Winthrop University where she taught, among other courses, Sociology of the Environment. She has been a gardener and environmentalist for many years and now manages the I'On Butterfly Garden in Mt. Pleasant, SC, which she co-founded in 2015. Hello I was also raised by parents and my granddad with the help of Rodale and their booklets prevennti and their phylosophy of you are what you eat.